We begin the year 2017 in enthusiastic anticipation of the Sixth IJME National Bioethics Conference, a time of exciting debate and sharing for the bioethics community. This NBC’s theme of “Healing and Dying with Dignity” focuses on the inevitable end of life and the clinical, social and psychological challenges of dealing with it with sensitivity and with the available resources. Several articles in this issue contribute to that theme with subjects like the attitudes of nurses to euthanasia, the state of palliative care in a country’s health system, and how basic life saving care is denied simply due to poverty. An author explores how philosophers have looked at the dreaded subject of death and relates this to the personal. ‘Going under the knife’ takes on a sinister edge in a report on unnecessary hysterectomies foisted on poor and marginalised women who end up the poorer in all possible ways. Potentially harmful cosmetic surgery is also discussed in a case study, while a comment critiques the approach of an international regulatory agency. 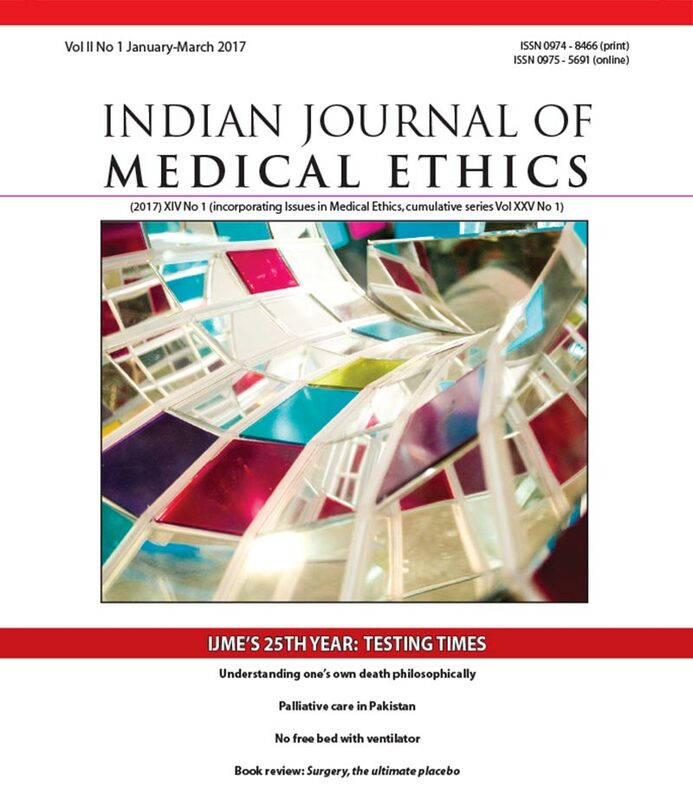 IJME begins its 25th year, a milestone in its survival for a journal which has become a nucleus for the ethics movement in the country and the region. The editorial lays out the crucial questions which ethical practitioners will have to decide on in the near future. Cover credit: “Embracing Diversity”, by C Priyadarshini. This image reflects the beauty that can be achieved through diversity and inclusiveness. The IAB Congress 2016: Is there justice in the bioethics world? 4D ultrasound imaging – ethically justifiable in India?